Transit prices are unaffordable for an increasing number of people in British Columbia. But they’re especially costly for recipients of welfare, who today receive only $375 for housing and $235 for everything else, including groceries, bus fare, clothing, emergencies, and otherwise. The expectation is for recipients to budget (somehow) for transit costs, despite their low income. In British Columbia, while we’re seeing rising MSP costs and ferry costs, we’re also seeing the wealthiest residents in the province receive tax breaks. Last year’s provincial budget implemented a tax cut for the richest 2%. For those receiving welfare, a $2.75 bus ticket is a big deal. I’d like to put this in perspective. Or consider the cost of a $91 one-zone monthly bus pass in Vancouver. For someone paid $5,000/month this would mean spending $745 on a monthly bus pass. If the transit police find someone on the bus or skytrain without a valid fare, they can give them a $173 fine. If unpaid, the fine prevents people from renewing their driver’s license and often refers them to a collections agency. The government has made adjustments for some people receiving social assistance in the past. Until September of this year, people receiving PWD assistance (Persons With Disability) could choose to pay $45 annually for a 3-zone bus pass. Not surprisingly, the 2016 provincial budget includes no plan to to improve the lives of people receiving social assistance. The BC Liberals have decided to cancel the subsidized annual bus pass, increase PWD rates by $77 per month for a single person, offer a $52 subsidized monthly bus pass, and charge $45 a year fee for this service. All fees and “increases” considered, someone receiving PWD and paying for the new subsidized bus pass will receive an increase of only $25 per month, after being without any increase for almost 9 years. But even the Liberals’ own finance minister, Michael de Jong, recognizes that this increase won’t make life any better for PWD recipients. Not only does this increase not catch up with inflation, but the rates were already too low to begin with. Welfare rates have still not been raised. At the homeless shelter where I worked many shelter guests were receiving welfare. Each time they had to get to an appointment they always had to worry about getting stopped by transit police and receiving a fine for evading bus fare that was too expensive to afford multiple times per week. Here’s another obvious example of a non-profit filling a gap that the government created. As shelter staff, we had a limited number of bus tickets that we could give out. As a result, we were told to give bus tickets only to people with confirmed medical appointments. If someone asked us for a bus ticket to get to a medical appointment and if they had no written appointment slip to use as proof we had to call their medical clinic, identify ourselves as shelter staff, and confirm if there was an appointment. This practice of phoning the clinic prioritized “outing” people as homeless over trusting their word and giving them a bus ticket. It also meant that housing appointments, job interviews, visiting family, and otherwise weren’t seen as a priority for receiving a bus ticket. Transit is just one of many ways that we see unjust costs imposed on people living in poverty. Our taxes are intended to be used for our shared benefit, not just to survive but to thrive, and to remove barriers preventing us from living healthy, fulfilling lives. Instead we have chosen to prioritize the wealthiest residents, raising costs elsewhere, including transit fees, and then shaming the poor when they can’t win against these systems designed against their best interests. Amen. So happy to have someone do the math for me a break down a serious injustice that I witness daily on public transit. How do we defeat these classist jerks?! I use public transit to visit my parents in the suburbs. I often pay around $2 per bus ride to get a transfer, and then use this one zone transfer to go a 2 zone distance. This is my cost saving matrix, it requires a benevolent driver. My insanely cute often helps them bump out a ticket for me… but I wish less adorable folks also had a cheaper option…. That is why I left B.C. & will never return as a resident! When I arrived in Alberta I was put on Alberta Medicare as well as Senior Blue Cross. I got new glasses,New teeth both upper denture & lower partial and new hearing aids. No questions asked. Alberta don’t charge their seniors for medical. Roger Powell….Don’t get carried away about Alberta. You are a senior, not on social assistance.or AISH (assured income for the severely handicapped). Like in BC there is still a belief in the deserving and the undeserving poor. Also….not all seniors are in need but they (and someday me) receive some benefits not available to the working poor, notably prescription drug coverage. Age is not a good reason to give benefits. It should be about need if not universal. So, seniors in BC, based on their age alone, get subsidized monthly bus passes at the same rate as eligible Income Assistance recipients..ie $52/mo but do not pay a $45/yr ‘administrative fee’? Seems to be a case for attention of the BC Ombudsperson, minimally or a legal challenge, ultimately. I thought it was the other way around; Seniors still only had to pay the $45 administrative fee. Still, for a government who is calling these changes “fair,” it doesn’t seem fair to anyone at all; in this case, almost discriminatory. The numbers are based without the rent portion taken off. The support if you are lucky enough to find housing for $350 which doesn’t exist in Vancouver is only $235 a month meaning you make the choice of Mr. Noodles and KD and risk the $170 fine or you starve. Thanks for noting this Shawn. I debated whether or not to use $235 or $610. I decided on $610 only because I compare this total monthly income with the two other monthly income examples of $3000 and $5000. I have been barely making it pre-increase, I cancelled my bus pass to pay bills and afford more groceries and now I am more housebound than before between my anxiety/mental health issues (and NO substance issues) and not being allowed to have the freedom of old bus pass program is just disheartening. This program which I did not use it enough for $52 (not even a quarter of that), was usually to go to appointments with my doctor, outreach workers and possible assisted housing subsidies societies – but I guess since all subsidy programs have had cut backs and can’t assist me anyways – I had no choice really but to cancel. 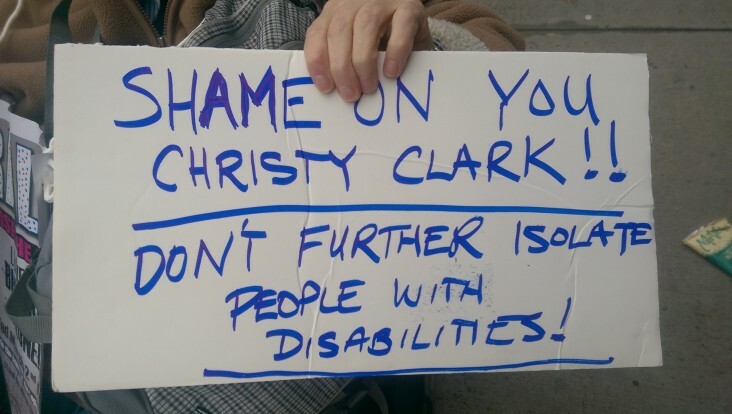 This is to me was a way to exasperate pre-existing obstacles people of all disabilities have in the Lower Mainland. Have anxiety, shut-in tendencies, depression, etc? well now feel even less welcomed by the world by this cruel bait and switch. And I can’t even imagine how much harder it is on people with physical disabilities! Shockingly enough on top of all this my somewhat affordable housing (filled with many people on disability – I had assistance getting housed here from the MPA housing program) went up (the notice on my door September 1st) in rent almost as much as what would have been the remainder of the disability increase if I kept the bus pass program, coincidence? Basically, this increase would have kept me same or worse off if I kept the bus pass program. Which could have lead to being homeless (and that is still an eventuality I worry about every day). Vancouver already has a hard enough time to accommodate those with disabilities, even if on disability – clearly they have never had the unfortunate experience of being (barely keeping) housed or homeless with disabilities in this city.